Rhett Bechtel is a senior accounting major at Southern Nazarene University and is the captain of the SNU golf Team. After playing for SNU for four years, Rhett was recently recognized as the Great American Conference (GAC) golfer of the week for winning the Houston Classic. Bechtel fell in love with golf at age 11, almost by chance, after his grandfather won a golf club and his mom took him to a driving range. For golfers at Bechtel’s level, being introduced to golf at 11 is fairly late; however, Bechtel’s determination and passion for the sport has taken him farther than many athletes ever get. The results that Bechtel has achieved while playing for SNU are reflective of the work that he has put in for years. 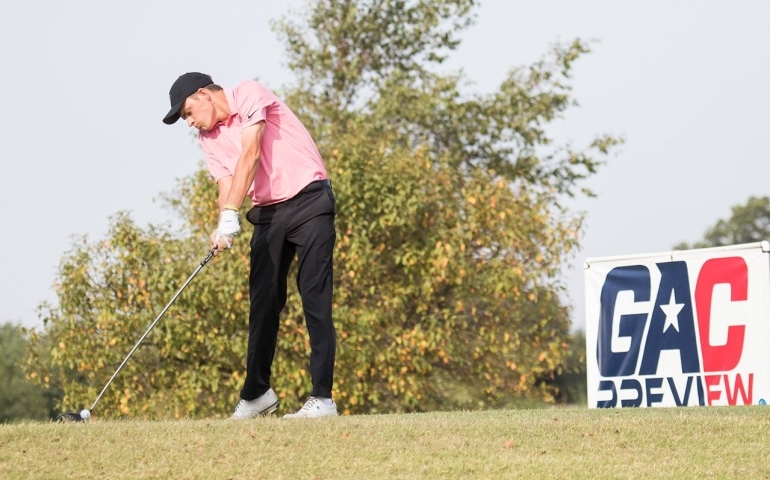 Bechtel came to SNU after being recruited by Coach Taylor, who had seen him golf through his high school years, and his time at SNU has led him to become not only a great golfer but a great leader as well. Bechtel does not have any solidified plans for after graduation, but it is possible that continuing his golf career is not entirely out of the question. Bechtel admitted that it is difficult to become a professional golfer; however, he did say that “it is definitely not entirely out of the question,” and a lot is dependent on this season. Rhett Bechtel’s dedication to golf and his love for competition has shaped him into a remarkable athlete and valuable asset to his team. However, it is his humility and his friendliness which are both apparent to those who meet him that make Rhett Bechtel one of the best athletes and leaders that SNU has to offer.